Attacks on rights activists, harassment of Alexei Navalny's campaign and the slow-motion terror of deportation to Uzbekistan. Novaya Gazeta journalist Khudoberdi Nurmatov faces deportation to Uzbekistan. Source: Ali Feruz's Facebook page. This past week has been a difficult one for Russian civil society, with assaults on activists, fake news and a number of new criminal prosecutions. 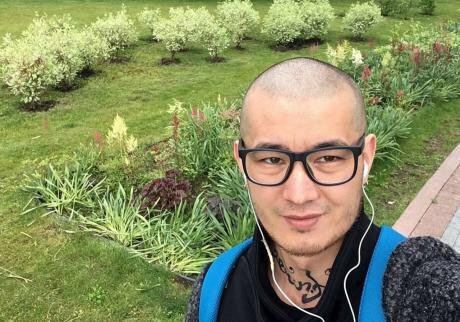 The authorities are seeking to deport Novaya gazeta journalist Ali Feruz to Uzbekistan where his life is in danger. Feruz was detained on the afternoon of 1 August, the same day a court ruled the journalist should be forcibly deported to Uzbekistan. After the court hearing Feruz attempted to commit suicide. The journalist said he would rather die than return to Uzbekistan. Court bailiffs prevented him from cutting his veins; they also later beat him as he was being transferred to the Temporary Detention Centre for Foreign Citizens in Sakharovo (Novaya Moskva). In Uzbekistan, Feruz was tortured and the security services had sought to make him an informer, after which he left the country in 2009. 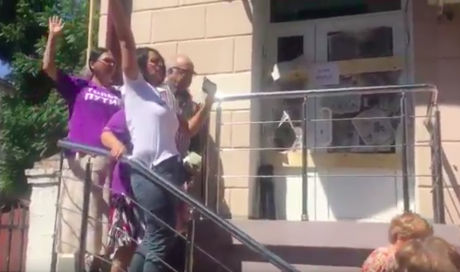 Four people were detained in single-person pickets in support of Ali Feruz on Thursday in Moscow. Those detained were charged with administrative offences under Article 20.2, Section 5, of Russia’s Administrative Law Code and released. This week a number of activists were assaulted. In addition, there was an attempted murder. On 24 July, Vladimir Burmistrov, a member of the “Nation and Freedom Committee” and a candidate in Moscow’s forthcoming municipal elections, almost died when unidentified persons unscrewed the bolts on one of the wheels of his car, as a result of which he was involved in a crash. Previously, Burmistrov had been threatened by officers from the anti-extremism police. On 27 July in Ufa an unidentified person assaulted civic activist and journalist Anver Yumagulov. In hospital Yumagulov’s injuries were recorded as including broken ribs, nose and jaw. 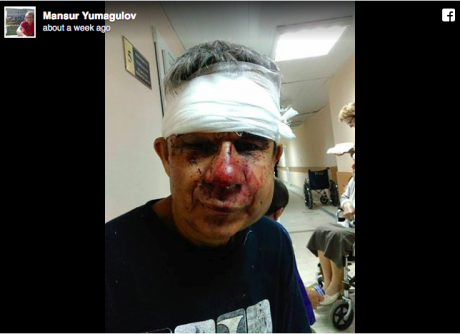 Anver Yumagulov, a rights activist from Ufa, after a brutal beating on 27 July. Source: Instagram. A court extended the pre-trial detention of Dmitry Krepkin by six months. Krepkin has been charged with using force against a National Guard officer at the 26 March protest in Moscow. His prosecution is the fourth to have reached the courts following the break-up by police of the protest on Moscow’s Tverskaya Street. Krepkin has maintained his innocence of the charges. He also says he was assaulted at the time of his arrest. Doctors at the emergency medical centre recorded very extensive bruising resulting from at least six blows. The National Guard officer who allegedly was injured as a result of Krepkin’s actions did not seek medical treatment and did not make an official report about the alleged offence. OVD-Info attended the preliminary hearing in Krepkin’s case and spoke with his mother about her son and his conditions in the pre-trial detention centre. New charges — albeit very different from each other in nature — have been brought against two individuals currently serving terms in prison. Anarchist activist Ilya Romanov has been charged with incitement of terrorism on grounds of a video with Hebrew subtitles in which a woman from Chechnya calls for “combating kaffirs [unbelievers in Islamist terminology].” Romanov, a 50-year-old anarchist from Nizhny Novgorod, is currently serving 10 years in prison on charges of terrorism. Romanov’s “crime” consisted in the fact that in the autumn of 2013 a firework exploded in his hands, causing severe damage to his wrist. OVD-Info has learned the latest details of the new prosecution. Rinat Galiullin, convicted in the 2013 Hizb ut-Tahrir case in Chelyabinsk, for which he has served five years in prison, is facing a new prosecution. On the day his prison term ended, Galiullin was not released. People in civilian clothes arrived in a car at the prison colony, some of whom proceeded to film events with a video camera. Subsequently, a police investigator telephoned Galiullin’s wife to say that her husband was now being prosecuted under Article 205.5, Section 2, of the Russian Criminal Code (“participation in the activity of a terrorist organisation”). According to the investigator, while in prison Galiullin had conducted “collective and individual discussions” with prisoners and had sought to involve them in the activities of Hizb ut-Tahrir. Galiullin has served a prison sentence for organizing the activity of an extremist organization and preparing activities aimed at the violence seizure of power. 31 July: Alexei Navalny's Krasnodar campaign office is attacked by a "Putin brigade". Source: Twitter.The persecution of participants in Alexei Navalny’s election campaign continues. Moscow’s Simonovsky district court fined Navalny himself and the head of his election campaign, Leonid Volkov, 300,000 roubles each, while the head of the Moscow campaign headquarters, Nikolai Lyaskin, was fined 250,000 roubles, for urging the public to take part in a “campaigning weekend” on 8 and 9 July. At the end of July, members of the “Putin Brigades” boarded up the entrance to the Navalny campaign’s headquarters in Krasnodar. In various cities Navalny supporters have been refused permission to organise campaigning in the streets. For example, in Krasnoyarsk campaigning was banned on the grounds of events celebrating the baptism of Rus, the cleaning of municipal fountains, the “July Heat” marathon, and the restoration of a clock tower.